Tickets for the official warm-up fixtures ahead of the ICC Men’s Cricket World Cup 2019 will go on sale at 10am (BST) on Wednesday 10 April, to coincide with 50 days to go until the tournament gets underway on 30 May. Ten warm-up fixtures will be played between 24-28 May, with each competing side playing two matches ahead of the main tournament. 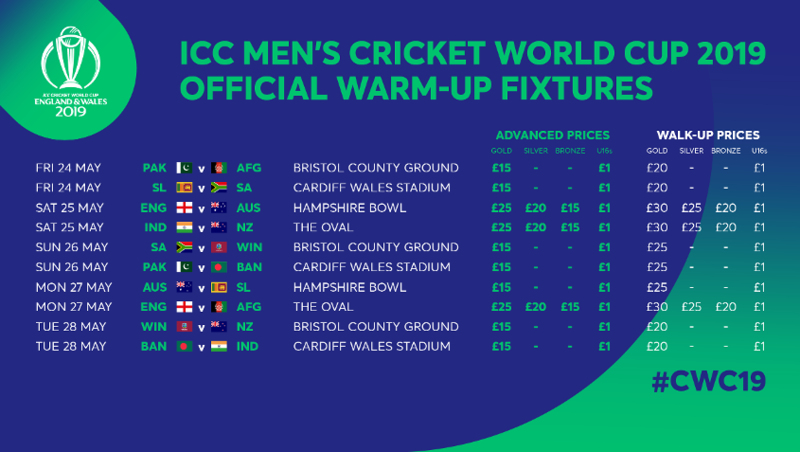 The warm-up fixtures will be held across four official CWC19 Host Venues: Bristol County Ground, Cardiff Wales Stadium, Hampshire Bowl and The Oval, but will not carry official ODI status. Ticket prices for the fixtures start from as low as £15 for adults and £1 for under 16s. Tickets for seven of the ten warm-up fixtures will have a maximum advanced price of £15, while the top advanced price for any fixture is just £25. Fans will be able to purchase tickets for the warm-up fixtures on the Official CWC19 Ticketing Site from 10am (BST) on Wednesday 10 April using their existing account details. Tickets will be available at the venues on the day of fixtures, however, prices will be £5 higher than pre-booked tickets, therefore fans are advised to book their tickets in advance. The ten warm-up fixtures will provide fans who were unsuccessful in applying for CWC19 tickets the opportunity to see some of the world’s greatest players as they fine tune their preparations for the Cricket World Cup. ICC Men’s Cricket World Cup 2019 Managing Director, Steve Elworthy, said: “With the exceptional demand we saw for Cricket World Cup tickets, we’ve made an effort to make ticket prices for these fixtures affordable to give families and unsuccessful ticket applicants another chance to be part of the world’s greatest cricket celebration. As per previous ICC tournaments, warm-up fixtures will be 50 overs per side, but will not carry official ODI status, as teams can field all members of their 15-man squad during the match. The ICC Men’s Cricket World Cup 2019 warm-up games will be focussed on making sure the teams prepare as well as possible for the tournament. Therefore, fan activation around the host venues and cities will be minimal compared to what fans can expect during the tournament.